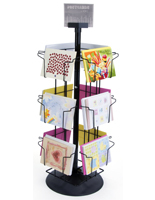 These Greeting Card Racks Feature 12 Pockets for Standard 5x7 Card Stock. Made of Attractive White Wire, These Displays are Ready-to-Ship! 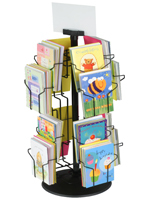 Buy These Greeting Card Racks for Your Store Now! Tabletop design brings merchandise to eye level. Offer customers easy browsing with rotating display. Showcase your stock with these contemporary pockets. 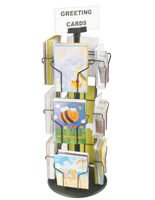 Greetings Card Racks are an Inexpensive & Attractive Way to Sell Your Stock! 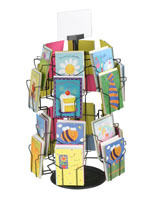 These greeting card racks for countertop are revolving to offer customers easy browsing capability. Each of these display units have pockets for 5" x 7" merchandise to sell in your store. 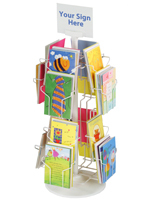 These greeting card racks are made of white wire and a white plastic base. 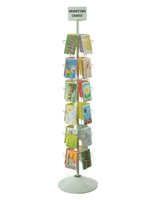 These revolving storage racks have 12 pockets that are 5 1/2" wide x 8 3/4"h (rear) x 1 1/2"d. These greeting card racks are 29" tall, and 12" in diameter. These wire rack systems also come with a sign holder that gets mounted to the top of the unit to hold a 1/8" thick acrylic or plastic sign. 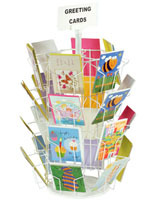 No tools are needed for these easy-to-assemble greeting card racks. 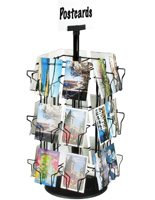 Place one of these wire rack systems on a tabletop to give customers a chance to look through your paper wares. Place one of these display units at the front of your store near the cash register, and watch cards fly off the shelf as people check out! 11.0" x 28.5" x 11.0"
5.5" x 8.8" x 1.5"